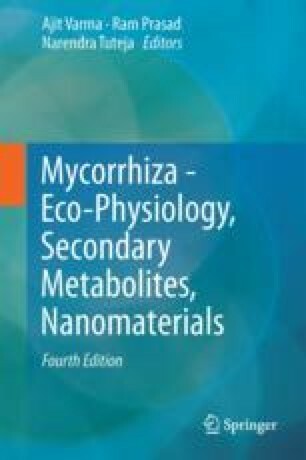 Arbuscular mycorrhiza (AM) is the most widespread plant symbiosis that improves plant productivity and resistance to nutrient stress. Numerous studies have demonstrated a high variability in the symbiotic outcome of different combinations of host plant and AM fungi. This reflects functional diversity in AM fungi in terms of variation in underlying physiological processes. The variability exists not only between isolates of different species but also within different isolates of the same species. This can be correlated to the high genetic variability observed within this group of fungi. However, little is known about the genetic diversity of AM fungi due to the strict biotrophy of these fungi, difficulties in obtaining sufficient fungal material, and to the lack of knowledge of the reproductive system and the mutation rate. Studies have shown that within the same cytoplasm, AM fungi contain thousands of nuclei and show extremely high levels of genetic variation for some loci. However, knowledge about the arrangement of this variation between, or within, nuclei remains controversial. It has been proposed that AM fungi could either be homokaryotic or heterokaryotic. In addition to genetic diversity, variability in life strategy patterns of different species could account for the functional diversity in AM symbiosis, for example, variation in the hyphal growth, rate of phosphate uptake and transfer and even in expression of specific genes. This review thus attempts to discuss the reported findings on the genetic and functional diversity within this mutualistic symbiotic association. The authors are grateful to the Department of Biotechnology (DBT), Government of India for providing financial assistance for undertaking the research in the above context.